Click the button below to add the 1156-17-5630-WW (1141) Warm White Elite Series Brighter Samsung 5630 LEDs BA15s Base to your wish list. LED lights. Elite series. warm white. Excellent product. 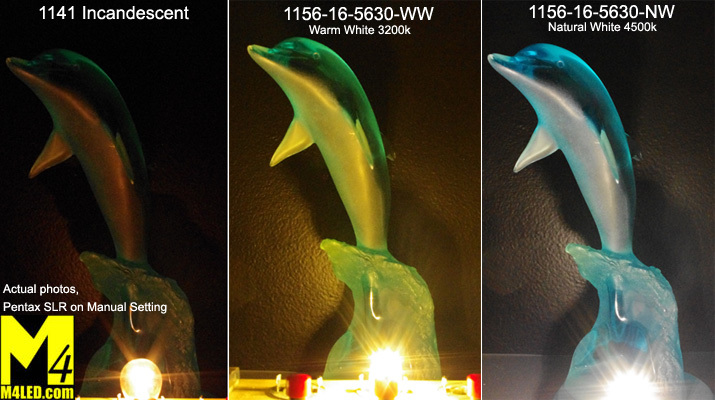 Brighter than our other led’s, warmer, and we suspect longer lasting. Superior customer service. Very quick delivery. Very satisfied. I have converted both my motorhome and my pop-up camper to M4's LED lights over the last year. They have included round base bulb style, G4 style, and florescent style bulbs and one new fixture. I have been very pleased with every purchase. When needed the customer service at M4 is extremely helpful. the product was as expected and the light from this product was excellent and illuminated my camper better than the incandescent. they also did as expected when it came to power draw, my battery still had quite a lot of power left after 3 days of using my camper with out hooking it up. These M4 LED lights seem to be of the highest quality. I really like M4's website, where you can learn about bulb bases and the different "tones" of their bulbs. My bulbs were a little expensive, but seem to be worth it. Purchased 6 more of these bulbs to finish out the interior light retrofit. Batteries don't even know their on when boondocking. Best LED'a made by these Awesome company. Am replacing all the incandescent bulbs in my 2012 Arctic Fox 811 Truck Camper with LED. After testing cool white vs. warm white, i decided on the warm white LED. Cannot tell the difference between incandescent and LED! Color and temperature and identical from what I can tell. Uses a fraction of the energy and produces almost no heat. These bulbs are much cooler and safer. After accidentally leaving an incandescent on and melting a light cover, we feel better about the safety of these bulbs. Also, they are brighter and will last longer! replace all the old bulbs in my camper. suburb service and bulbs are great and easy to install. I received my order almost the next day! They go in so smoothly, replacing the hot 12v bulbs. Wonderful service and wonderful product!